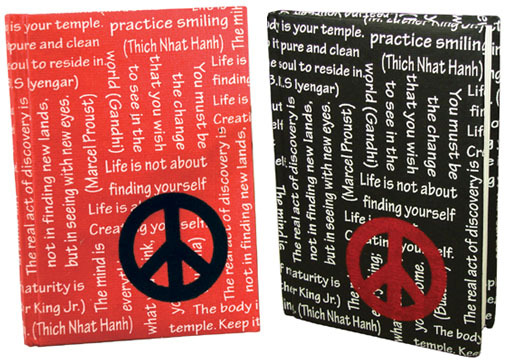 These journals, hand-crafted by artisans in India, features a peace symbol and positive quotes (example: "You must be the change that you wish to see in the world" - Ghandi). The paper is eco-friendly, or "Tree Free", made by recycling cotton waste from the textile industry and turning it into a pulp. The journals measure 5" x 7" (12.7cm x 17.7 cm) and contain approx. 48 pages. Copyright © 2015 The Peace Channel Network, Inc. All rights reserved.